Well check to make sure you're not hooking up to a ground. The wires of interest to you (on the body wiring) are the brown, gray and light green wires. Brown is the wire labelled "E" on the third gen harness, gray is "D" and light green is "C". The light green wire isn't as thick as the other two. Brown should be hot when the ignition is on, gray gets power from brown whenever the controls are on any setting but off, and light green gets power from brown whenever the controls are on an AC setting or defrost. There are two other wires from the body that aren't hooked up to the switch. Dark green and black. Dark green is "B" on the third gen harness and black is "A". Dark green is supposed to get a ground from black whenever an AC setting is selected. Unfortunately the 4th gen switch does not have any way of supporting this feature. I would check to make sure that you aren't accidently using the dark green or black wire. This could cause the short if you are. 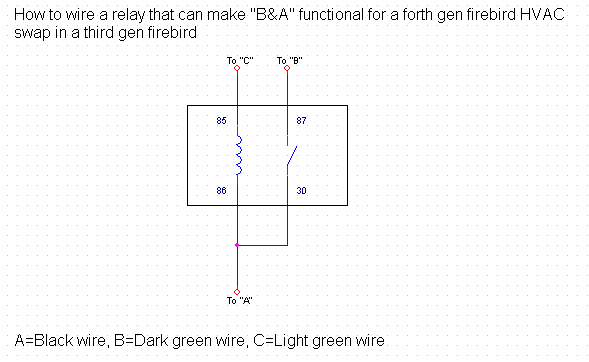 Couldn't a relay be wired up to get "B" and "A" to connect to each other by using the power from "C"? All you want is B&A to connect to each other when A/C switch is on, right? Anyone? Are the B&A wires really needed? A relay will make B&A functional. Here's how. "C" is wired to both the a/c controls and this relay. When "C" is switched on by the A/C controls, it will also give power to the relay. When the relay energizes(has ground and power across it), it closes the switch inside and connects B to A. Last edited by Firebat; 07-18-2006 at 01:48 PM. Yah, I had thought of the relay. If you know where to find the relay, let me know. I had a few extra from the LT1 swap and then a few more extra from the dash swap. Any relay meant for a car, with 4 wires will work, even 5 wires will - just don't use the 5th wire(87A wire). Any auto store sells them too. my gauge lights arent working. i also have lt1 gauges, but my tach is kind of jumpy i have 350 also. would hooking up to msd box fix this? if your tach is jumpy, you have a loose connection somewhere. could be power into the cluster or the tach wire itself. it idles fine, but when i give it a shot of gas it seems its revving higher then the motor really is, thats all i meant by jumpy. You need a Dakota Digital Tachometer calibrator. ok so if i had a msd box it wouldnt read correctly either? if your car is a v8 and you have a v8 cluster, etc. you shouldnt need a box. but there are exceptions. years of clusters. v6 cluster, ls1 cluster etc. see if everything is right before you buy a box and still have the same problems. an msd will not fix your problem either. one of their tach adapters might work. what motor and cluster are you running. etc... ? im running 350, the tach is supposedly from 95 lt1. 350 as in carb'd or efi? you run run a carb setup, and you 100% have a v8 cluster, you dont need a box, AFAIK. one wire, should work awesome. yeah its carbed. but when i rev it, it seems so floppy revvin up... quicker then it should. the guy could have lied to me about the tach being v8. it idles at 800rpm just like it should. if it wasnt a v8 cluster, idle wouldnt be at 800. somethings loose or damaged somewhere along the line. ive seen and done it strait to a stock tach before with no trouble. im having a problem with the dash, everything is ok. But for the bolts that hold the dash to the firewall at the top, if i have the farthest one on the passenger side and the middle one and TRY to put the driver side one in the screw doesnt even reach the dash. I have to put stress on it for it to go in, and i did. The next morning the passenger side dash bracket cracked and popped out. ok i need some big help with the wiring up of my lt1 cluster i have read everthing i could find took down notes anything to get these to work but i get nothing none of my gauges will move i think after i cut out my factory connectors i had three wires left over that i could not find a place for maybe a dark brown and a green i think not sure but shouldn't i see something working ar least? is it dark gree? could be your vehicle speeed sensor, or coolant temp sensor? if you hooked them up right, did you hook up the 3 grounds underneath the steering column? the 2 x brown isnt used. i dont see another brown one, you sure its not dark grey? the green could eitther be high beams, coolant temp. its just green right no green with black stripe which is your speedometer if its not a cable. it might be dark gray if it is whats it go to? i thought the two tanish wires went to the speedo? dark grey i didnt use, but there was only 1 dark grey, there are a couple other grey wires they are for illumination but are more lighter then the dark grey. did you ever come up with anything on this because i test fitted mine yesterday and seen the same thing? but any way thanks for all your help roughskinjrz i seem to have the gauges working but the high beam light but im having the jumpy tach problem and i have tryed an ls1 and two different lt1 clusters and get the samething so i started on the headlight switch and now im hung-up on that my factory switch has a orange,red 2xyellow,gray,and white wire and the 4th gen plug was a orange,red,pink,yellow,and a gray or brown wire plus a thin black and gray wire but i figured that those two thin ones where for the light but maybe i was wrong! ok got the headlight switch working right but not the dimmer switch and i have no lights on my gauges and still the jumpy tach to get straight yet! Re: 4th Gen Wiring; Good Progress + Info! Where did you get this and do they have one for a 87 Firebird. I did the work and created it myself - so the answer is no, I do not have one for an '87 Firebird. if i could get a complete dash out of a 95 camaro for $125, but he says he cut the airbag and a/c heat controls out of the harness, do you guys still think it is a good deal?